Atlantic South Region: Game. Set. Pickleball. 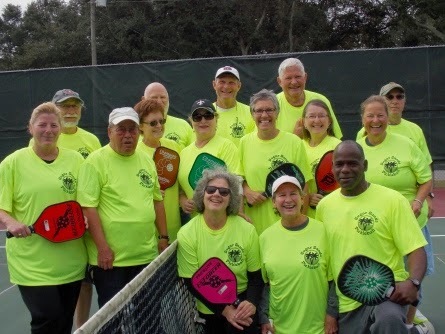 While such a sport may sound made up, pickleball has proven to be the fastest-growing racquet sport in Port St. Joe and Mexico Beach (FL) with leagues and homemade courts popping up at a rapid pace. Players are so enthusiastic about the game that both the Mexico Beach city council and the Port St. Joe city commission have held conversations about creating permanent courts. The sport, which combines elements of tennis, badminton and Ping-Pong, is a game in which two, three, or four players use solid paddles made of wood to hit a perforated ball, similar to a whiffle ball, over a net. The game was invented in 1965 on Bainbridge Island, near Seattle, W.A. by three fathers. The legend goes that the men’s kids were bored with their usual summertime activities so the men designed a paddle sport to be accessible to all ages and skill levels with a set of rules that were easy to learn.